Cisco Systems had an interesting projection of the total amount of network traffic due to machines talking with other machines. But you might be surprised by the second-leading source of the expected surge in traffic. It won't come from people, but from machine-to-machine communications, or "M2M." Think of sensors in cars and in appliances, surveillance cameras, smart electric meters, and devices still to come, monitoring the world and reporting to each other and to centralized computers what they're detecting. The chart below, reprinted from the Cisco report, shows just how extreme the jump in machine-to-machine communications could be. 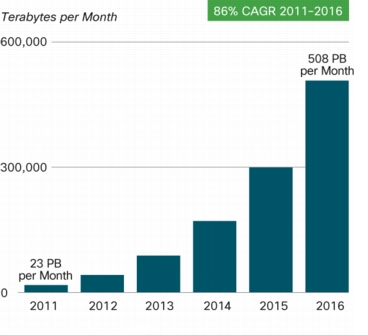 It is expected to grow, on average, 86 percent a year, and by 2016 it is expected to reach 508 petabytes a month, or half a billion gigabytes. Take a look at these two related articles: RoboEarth Lets Robots Learn From Each Other and Lingodroid Robots Invent Spoken Language.